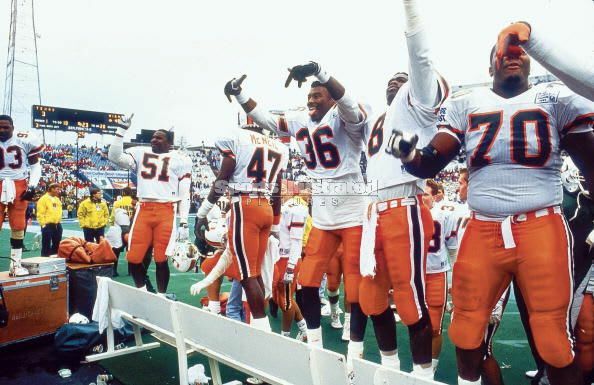 Not the best team of all time (not even the best Miami squad), but the most badass, based on one game: the 1991 Cotton Bowl a.k.a. The Wrongest Game in Football History. With nothing to play for (they'd already lost two games and were out of national championship contention), the 'Canes went into Dallas and humiliated a Texas team that had an outside chance at a chip. Believe it or not, the 46-3 score doesn't tell the full story of the drubbing: the Longhorns had one passing first down, but gained six via Miami penalties (UM picked up 202 yards in penalties, mostly unsportsmanlike conduct). Before T.O. danced on the star in Dallas, and before touchdown celebrations had to be regulated, Miami was stomping at midfield in the C.B. and Randal Hill was running halfway up the tunnel firing imaginary pistols after scoring. The quaint part? The announcers are more amused than outraged. Everything was better in the '90s, huh?